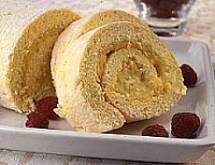 Light and refreshing, this sponge roll with lemon curd filling will delight your guests through the holidays and all year round. Position a rack in the center of the oven and preheat it to 350 degrees F. Lightly coat a 10-by-15-inch jelly-roll pan with shortening or vegetable spray, then line it with baking parchment or wax paper. Coat the paper with shortening or spray and dust evenly with flour; tap out excess flour. In a medium-size enamel or stainless steel saucepan, whisk together the sugar, cornstarch, flour and salt. Whisk in the orange juice, lemon zest and lemon juice. Set the pan over medium heat and whisk until the mixture comes to a boil. Boil, whisking continuously, for 1 full minute (count to 60) until thickened and clear. Remove from the heat and whisk in the cream. Set aside to cool. If made several hours in advance, refrigerate until ready to use. Separate eggs, putting the yolks into a large mixing bowl and the whites into a grease-free medium bowl. Touch the whites with your fingertip. If they feel cool or cold, set the bowl inside a slightly larger bowl of hot (not boiling) water and stir until the egg whites feel comfortably warm to the touch. Sift together the flour and cornstarch into a small bowl. Combine the egg whites with the salt. With a mixer on medium speed, whip the whites until foamy, then gradually add 6 tablespoons of the sugar while beating continuously. When the whites look thick and foamy, increase the speed to high and beat until the whites look smooth and satiny and you begin to see beater tracks in the surface. Beat just a little longer until, when the mixer is turned off and the beater is lifted, the foam makes a peak that stands straight up on the tip. Scrape the foam from the beater into the bowl, then set the egg whites aside. You don't have to wash the beater. Beat the egg yolks with the remaining 4 tablespoons of sugar until they are light and at least double in volume. Stop the machine and scrape down the sides several times during beating. Beat in the vanilla, lemon zest and juice. Whip until the yolks form a flat ribbon falling back upon itself when the machine is turned off and the beater is lifted (about 5 minutes). Fold about 1/3 of the whites into the yolks. Sprinkle on about 3 tablespoons of flour mixture and fold. Cut the spatula down through the center of the foam, turn in and draw it up along the side of the bowl. Give the bowl 1/4 turn and repeat, sprinkling on more of the flour mixture and adding more whites. With each fold, turn the spatula upside down as it comes over the top, so you rotate it in a light motion and cut through the mass without stirring or deflating the foam. Fold together all the flour mixture and all the egg whites. The batter should be light, airy and smooth. Spoon batter into prepared pan and spread to the edges. Bake 11 to 13 minutes, until the top is barely golden and feels springy to the touch. Don't overbake or the cake will be dry and won't roll easily. While the cake bakes, spread a tea towel flat on the counter and sift about 1/4 cup confectioners' sugar over it in a rectangle about the size of the baking pan. As soon as the cake is baked, invert the pan over the sugared area of the towel. Peel off the paper. With a serrated knife, slice off a scant 1/8-inch strip of the crisp edging around the cake sides. Fold one short end of the towel over a short end of the cake, then roll the towel and cake together to form a roll. Place the rolled cake, seam side down, on a wire rack to cool. When the cake is completely cooled, unroll it, spread it with the cool lemon filling and reroll, using the short end of the towel to help lift the end of the cake and roll it over the filling, as if you're rolling a sleeping bag. Keep lifting and gently shaking, so that the cake rolls up creating a spiral of filling. Place the cake, seam side down, on the serving platter and sift on a little confectioners' sugar. Garnish with lemon, berries and mint, if desired.